Day lilies are rugged, adaptable, vigorous perennials that endure in a garden for many years with little or no care. Day lilies adapt to a wide range of soil and light conditions. They establish quickly, grow vigorously, and survive winters with little or no injury. Day lilies belong to the genus Hemerocallis and are not true lilies. This Greek word is made up of two parts: hemera meaning day and kallos meaning beauty. The name is appropriate, since each flower lasts only one day. Each daylily plant produces an abundance of flower buds that open over a long period of time. 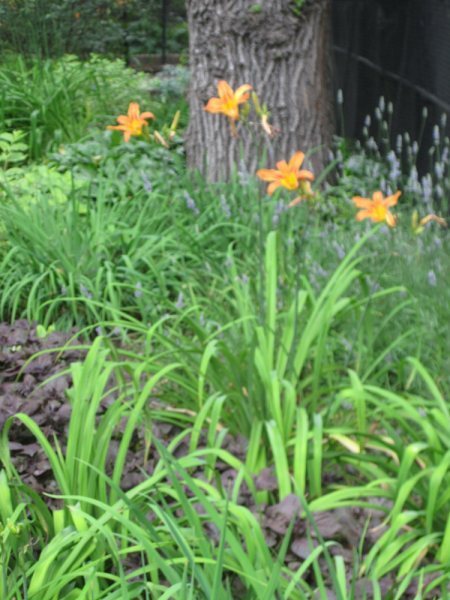 Although day lilies tolerate drought, they perform best in moist, but well-drained soils. One inch of water weekly is ideal, more frequent watering may be necessary on sandy soils. Remove seed pods after bloom to prevent seed production. Plants producing seed are likely to have fewer flowers the following year. The best time to transplant or divide plants is early spring or immediately after flowering. Plants divided in the spring may not bloom the same summer. Divisions should have two to three stems or fans of leaves with all roots attached. Make divisions by digging the entire plant and gently pulling the fans apart. Cut the foliage back, leaving only five or six inches. Place the plant in the soil so the crown (the portion where the stem and root meets) is one inch below the ground line. Water thoroughly after planting. A winter mulch of straw or shredded leaves helps ensure against winter injury for unestablished plants. Day lilies are vigorous growers and can be divided every three to four years. Day Lillies bloom gloriously along the southern fence. They constantly threaten to take over the garden and need to be divided and transplanted each year.